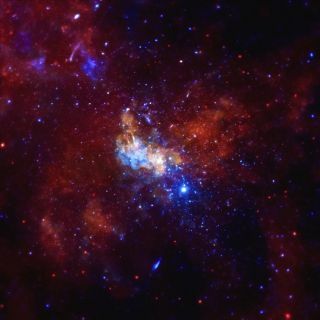 The supermassive black hole at the heart of the Milky Way galaxy, known as Sagittarius A*. The gigantic black hole at the heart of our Milky Way galaxy is coming into sharper focus. For the first time ever, astronomers have detected magnetic fields just outside the event horizon — the "point of no return" beyond which nothing, not even light, can escape — of the Milky Way's central supermassive black hole, which is known as Sagittarius A*. Supermassive black holes lurk at the core of most, if not all, galaxies. Sagittarius A*, which lies about 25,000 light-years from Earth, is about 4 million times more massive than the sun, but its event horizon is just 8 million miles (12.9 million kilometers) wide — less than the average distance from Mercury to the sun. The scientists studied Sagittarius A* using the Event Horizon Telescope (EHT), a system of radio dishes around the world that are linked up to form one enormous instrument sensitive enough to resolve features as small as 15 micro-arcseconds — the equivalent of spotting a golf ball on the moon, study team members said. In addition, the EHT data revealed that the supermassive black hole's magnetic field is incredibly variable, shifting markedly every 15 minutes or so. "Once again, the galactic center is proving to be a more dynamic place than we might have guessed," study lead author Michael Johnson, of the Harvard-Smithsonian Center for Astrophysics, said in the same statement. "Those magnetic fields are dancing all over the place." The researchers reported their results online today (Dec. 3) in the journal Science. The new study could help researchers better understand black holes, light-gobbling monsters that nonetheless blast out incredibly powerful radiation as gas and dust spiral into their insatiable maws, team members said. "With this result, the EHT team is one step closer to solving a central paradox in astronomy: Why are black holes so bright?" Doeleman said.